Two weekends ago my friends and I (and the hubbies) got together for a casual dinner. The setting couldn’t be more pleasant–our friends’ home is like a Mediterranean villa and equipped with the most modern comforts. I regret that I didn’t take my camera along so I can show you what I mean (with their permission, of course), especially since the spread they offered was just as lovely as the surroundings. We had fabulous fish tacos prepared by the gracious hosts and a to-die-for flan made by our other equally talented friends. 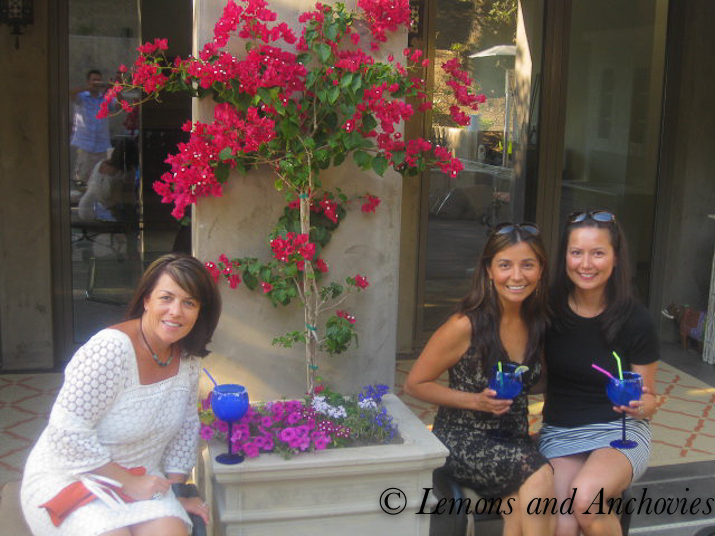 Coupled with refreshing libations, great company and the perfect California weather, it was a fun evening indeed. My contribution to the get-together rounded out the appetizer offerings. Since the day also marked the end of our house guests’ stay, I could only manage easy-to-prepare appetizers and Spanish tapas fit the bill. Frozen puff pastry was a life saver in this case since I wanted to make empanadillas (little empanadas, a meat-filled savory pastry) but didn’t have the time to prepare a traditional dough and a more elaborate filling. 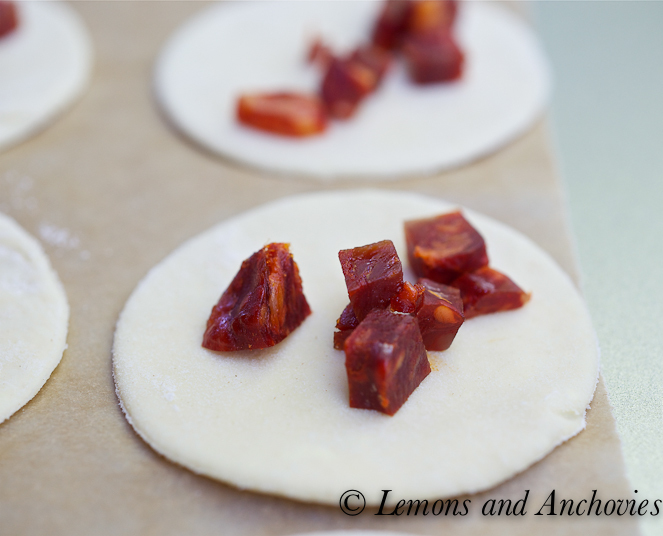 Instead, I defrosted a package of puff pastry, cut the dough in circles and threw in some chopped Spanish chorizo–done! Well, there was the small task of folding each one over and brushing with egg wash. Still, it was easy! The buttery, bite-sized pastries filled with flavorful, smoky, paprika-infused chorizo did a fine job of whetting our appetites. They went well with the margaritas, too. I also made little tartelettes. In keeping with my Spanish theme, I opted for a simple filling with mushrooms, Walla Walla onions and Manchego cheese (a nutty, Spanish cheese). The Walla-Walla onion and cremini mushrooms were sautéed in olive oil and later sprinkled with chopped fresh basil and the cheese. Baked in puff pastry “cups”, these vegetarian bites were a fitting complement to the meat-filled empanadillas. And yes, they also went well with the margaritas. But so did the chips and multiple fresh salsas and the homemade taquitos! Again, I wish I had taken more pictures but I was lucky to snap these hastily-taken shots before leaving home. Luckily, the tapas stayed warm during the short 6-mile drive. Next time, I’ll make real empanadas–my mom’s recipe. 1. Preheat oven to 400ºF. Lightly flour your counter and roll defrosted dough thinly. 2. Using about a 3-inch cookie cutter, cut the pastry into uniform circles. I was able to get 2o out of one sheet (after rolling out trimmings). Place about 1 teaspoon chopped chorizo onto each pastry round. 3. Dampen the edges of the pastry with water and fold over into a half-moon shape. Seal the edges by pressing with the tines of a fork. 4. Make a small slit in each one with the tip of a sharp knife. You can store the empanadillas in the refrigerator at this point until you’re ready to bake them. 5. When ready to bake, place each pastry on a baking sheet and brush with the beaten egg. Bake for 10-15 minutes or until they’re golden brown and puffed. They’re best served warm. 1. Preheat oven to 400ºF. Prep the defrosted pastry by rolling on a lightly-floured counter and cutting into 20 (roughly 3-inch) squares. Set each square in a mini muffin tray and store in the refrigerator while you prepare the filling. 2. Heat the olive oil and sauté the mushrooms and onion in a medium skillet on medium-high heat. Cook until both are tender and most of the liquid has evaporated. I salted mine a little while sautéing to expel as much of the mushroom/onion moisture as possible. Remove from the skillet and stir in the basil and cheese. 3. Place about 1 teaspoon of the vegetable filling into each pastry cup and bake for 15 minutes or until the pastries are golden brown. Remove from the muffin pan and serve warm. With margaritas in hand, my friends: The lovely hostess, my buddy since high school and me. Okay, I just finished off a late dessert (feeling a wee guilty) but NOW I want this! Do you ever crave something salty after a sweet dessert? this would be perfect right now! BTW, you guys are so adorable! You’re so lucky to live close to your friend from high school…mine are all back in NYC! What a beautiful group of women…and what a delightfully easy yet stunning appetizer. I was drooling from the very first photograph. 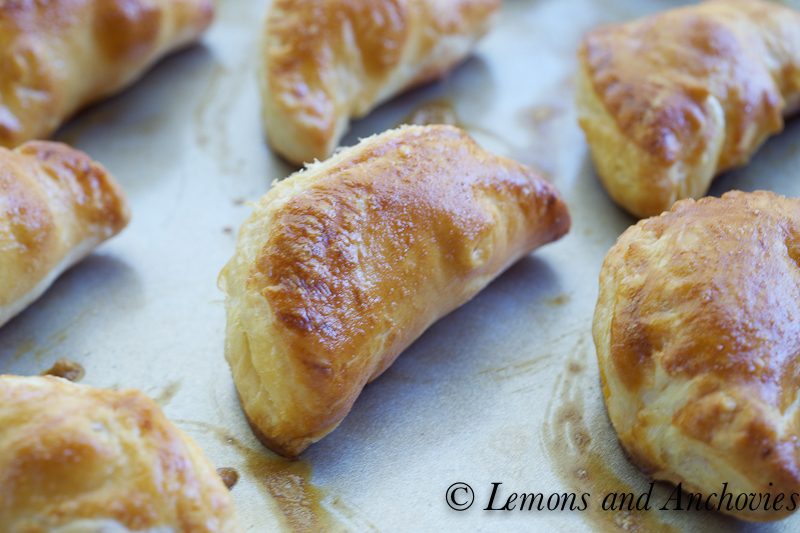 I love using puff pastry when I’m in a pinch, and it seems like you hit a home run with this recipe! I want those empanadillas. I lived on empanadas in chile and miss little pockets of goodness. Is there a place/brand of chorizo you like? I haven’t found anything spectacular. I’m sorry to say that I didn’t check the label–I hardly buy Spanish chorizo, but I really like this one. Next time I go to the store, I’ll have a look. Looks like a fun time with friends:-) Your apps all look scrumptious, thanks for the recipes. The blue glasses look fun too, nice to have friends close by to share good times. 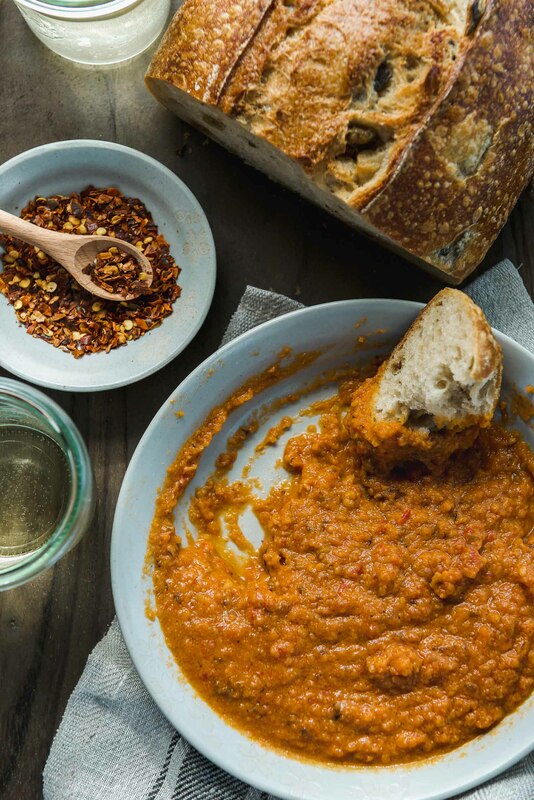 Your tapas look fabulous… no one would ever guess how easy-to-make they actually are. 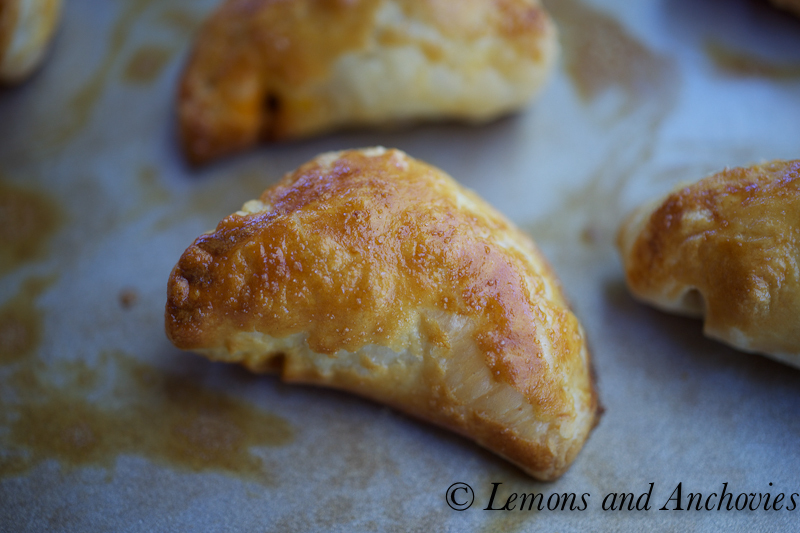 Love the shortcut of using ready-made puff pastry for the empanaditas, too. 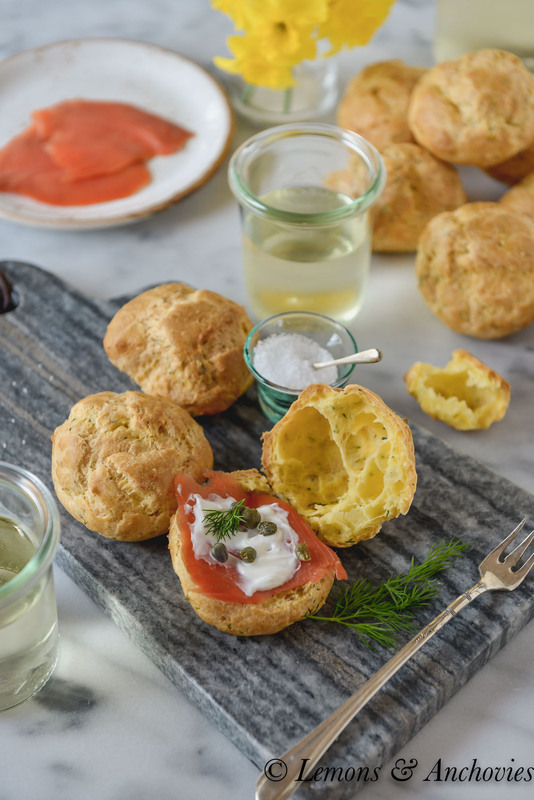 These look delicious and I have manchego cheese and cremini mushrooms in the fridge right now and I use puff pastry all the time because I’m just not much of a baker. What a fun day! What a perfect evening. Everything looks absolutely scrumptious. I enjoy every post that you publish! These are perfect for a villa get together for sure. Both tapas look delicious. In fact, the entire meal sounds great. It’s so much fun to share good food with friends! I love appetizers and yours look amazing! 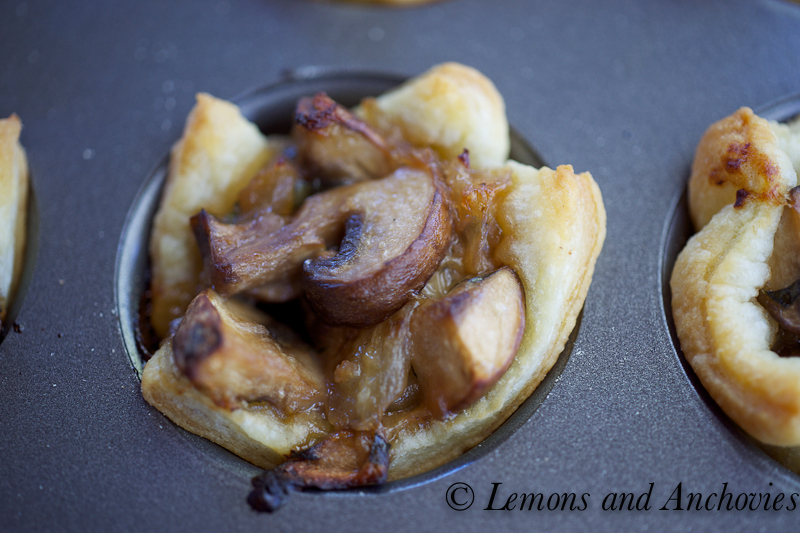 I am going to make those little tarts – so simple and get flavor profiles. Love the photo – you all look like you are having a wonderful time together. Nothing better than getting together with close friends and having great food. Really enjoyed your post! I’m always on the look out for great vegetarian tapas – I love the mushroom, onion and manchego tapa – sounds like something that could please even a hardened meat eater! These look fabulous for a cocktail party! Yum! 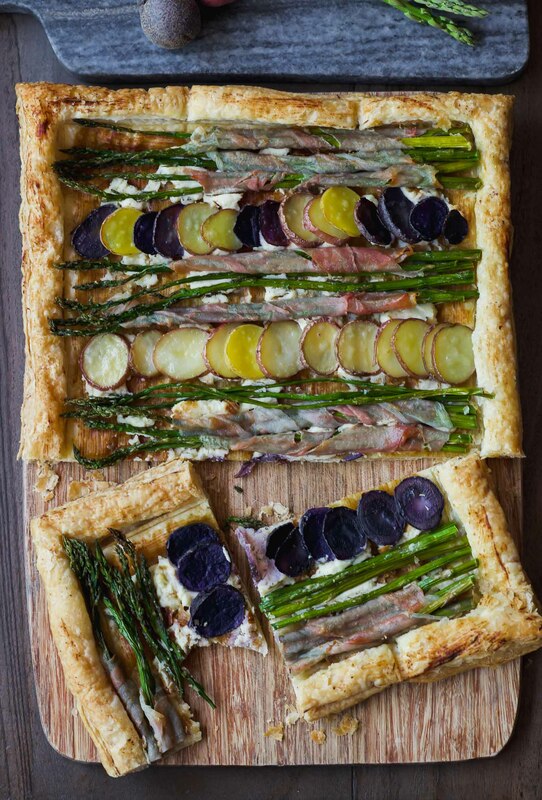 Love your contribution – you packed those tartelettes with flavor. I shall be inviting you to dinner. oh, your tapas look so good!! now, that’s my kinda food!! Empanadillas look tremendous. I am perpetually falling in love with Spanish cooking and tapas is simply the best way to enjoy a variety of foods and being able to lift yourself from your dinner seat at the end of your meal- that, of course, if there was a dinner seat in the first place, since tapas are technically consumed standing in bars. We in fact have a beautiful chorizo right now in the fridge. No puff pastry but it shouldn’t be that hard to round some up! Beautiful finger food! I would love to try that. They look easy to make. These would be great for parties. Thanks very much for sharing. Omg what wonderful tapas — I especially liked the empanadas MMMmmhmm! Food is always best enjoyed with good friends 🙂 Love this post!! Looks and sounds sooooo good. Plus you gals are just lovely!!!! Really lovely!